Relaxed Roman soft shades hang flat when fully extended with soft folds at the bottom that remain in any position. The swooped (or smile pattern) at the bottom hem lends a softer feel than a square bottomed shade. The flat-hanging upper section makes it a good choice to show off a fabric pattern. When stacked behind plain hung drapery panels or square bottomed valances, the curved bottom offsets a boxy look. Suitable for traditional, casual and minimalist themes, relaxed Romans allow the fabric to set the mood - with a soft accent. They can be mounted inside or outside the window casings. But are most commonly mounted outside the casings when serving as the only window treatment. This is because the curved folds at the bottom pull the fabric slightly inward, potentially creating a gap along the edge. Also, they cannot be lowered fully onto the window sill when mounted inside the casings. Medium weight fabrics that drape and fold easily work well. Lighter fabrics and sheers are also used, but require more hand dressing to appear even when raising or lowering. As in the pictures above, wider width windows call for a repeat of the bottom swoop. Generally, windows up to 54" wide can be a single swoop. Windows from 55" to 96" need a repeated or double swoop. Doorstep color Blue by Carole Fabrics. A fresh floral print. Shown in a neutral fabric with a repeated swoop. Mounted outside the window casing, behind a cornice board top treatment. Here with a vertical stripe with a single swoop. Mounted outside the casings, mid-window. The hourglass pull of the single swoop softens the vertical. Relaxed Roman Shade installed in Blackwood NJ. A double swoop relaxed Roman shade mounted inside a very deep window well. The semi-sheer horizontal stripe fabric was a very difficult choice for this type of shade. The fabric is lightweight and difficult to dress. Illumination through the shade was important, so interlining was not an option. The horizontal stripe appears to sag in the center, as the fabric bias supports the weight unevenly. However, the goal was to soften the very rectangular mission theme in the room while introducing a horizontal emphasis. You can see the widened gap at bottom edges as the swooped fabric pulls inward. This is why relaxed shades are often mounted outside the casings. 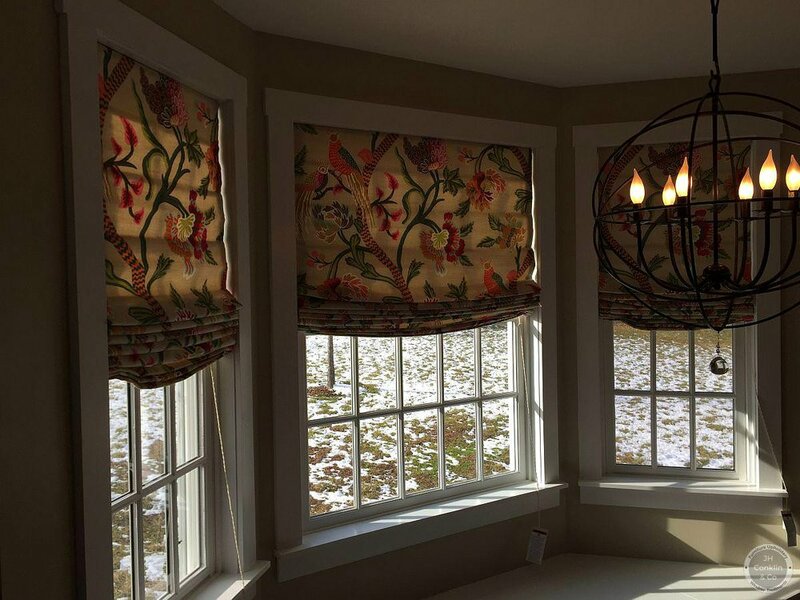 Single swoop relaxed style Roman shades in a Marlton, NJ kitchen. A very large and colorful pattern by Thibaut shows one of the advantages of the less structured shade. The fabric pattern unfolds to become a mural in the room! An inside mount accents the architectural elemant of the window casings. And an ivory lining keeps the warm tones set by the fabric despite the cool wash of sunlight streaming through the window. Bright afternoon sun overpowered the cellular shades in this New Jersey kitchen. And "with all the slabs of color in the room", she wanted something with some design interest. The door shade is mounted with a magnetic bar - preventing screw holes in the metal door! And the narrow head rail lets the shade operate behind the door knob. Relaxed Roman soft shades to grace your windows from the quality workrooms at Kasmir, Carole Fabrics and Robert Allen. Serving southern New Jersey, Delaware, Philadelphia and the Jersey shore areas.